ABS-CBN News correspondent RG Cruz reports that Makati 2nd District Rep. Abigail Binay "won a studio-type condominium unit worth P5 million in Rockwell Land's The Grove in Pasig City." The announcement was posted on Power Plant Mall’s official Facebook page. Asked about netizens’ violent reactions about her win, Binay (married name Campos) said, "If it was another person, you won't even think it was rigged. Even I was surprised. I didn’t expect it. The fact that I’ve won hasn’t sunk in. If I had rigged something, why not the lotto with a bigger prize or even a raffle with a car as prize? (This is) pure chance." 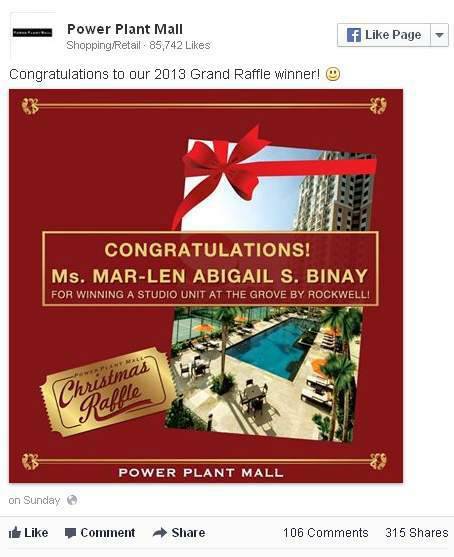 Binay said she had been given a raffle ticket in Rockwell’s annual Christmas raffle as part of a Power Plant Mall promo, which automatically gave those who purchased products at the mall amounting to a minimum of P2,500.